NEW ORLEANS – Lawyers representing the nearly 100 oil companies targeted in a lawsuit brought by a local levee board on the alleged role of oil exploration in coastal erosion argued today that the lawsuit should be dismissed. The defense attorneys said that the lawsuit, should it be allowed to continue, would subvert the powers of the state and federal legislature as well as that of regulatory agencies, such as the U.S. Corps of Engineers. The lawsuit was brought by the Southeast Louisiana Flood Protection Authority–East (SLPFA-E) against 97 oil companies for what they deemed is their role in coastal land loss experience by the state that makes areas of population more susceptible to property damage from storm surges. The lawsuit which was initially brought in the Orleans Parish Civil District Court, but was later removed to U.S. District Court for the Eastern District of Louisiana where it is being heard by U.S. District Judge Nannette Jolivette Brown. In the weeks leading up to the hearing two of the smaller companies named in the lawsuit, White Oak Operating Co. LLC and Chroma Operating Inc., settled with the levee authority for $50,000 each. 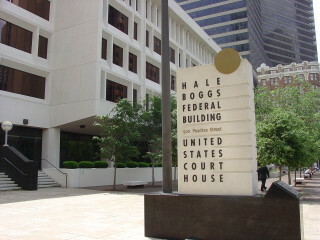 Arguing on behalf of the defendants, Robert Meadows, who represents Chevron, said that the lawsuit was improper in that it usurped the powers of Congress which created the laws the defendants are accused of breaking, the Rivers and Harbor Act, the Clean Water Act, or the Coastal Zone Management Act, and that any action taken against the companies should be initiated by the Army Corps of Engineers who are responsible for the permitting process allowing for energy exploration in coastal waterways. In addition, Meadows said the remedies sought by SLPFA-E, namely the remediation and infilling of canals dredged by oil companies, are in conflict with the master plan for the coastal protection as laid out by the Coastal Protection and Restoration Authority. Also arguing on behalf of the defense, attorney Keith Jarrett, of Liskow & Lewis, said that the lawsuit should be dismissed due to Act 544, which was passed by the Louisiana legislature earlier this year, that seeks to disallow such lawsuits to be brought by governmental entities. That law was deemed unconstitutional by 19th Judicial District Court Judge Janice Clark after a hearing last month–a ruling that is expected to be taken up on appeal by the Louisiana Supreme Court in coming months. During the discussion of Act 544 the bill’s sponsors, Sen. Bret Allain and Sen. Robert Adley, spoke directly to the SLPFA-E lawsuit in their reasoning for passing the bill. However, attorneys on behalf of SLPFA-E have argued that imprecise language included in Act 544 referring to the governance of such lawsuits brought on behalf of state and local governmental entities does not apply to them because they are a political subdivision and do not fit that definition. Jarrett indicated that the argument by SLPFA-E was a mincing of words and that the phrase was meant to be interpreted more broadly. On behalf of SLPFA-E, Lynn Swanson, whose law firm Jones, Swanson, Huddell & Garrison initiated the case on behalf of the flood authority, maintained that while the intent of Allain and Adley was clear, the court should not force the intent of the two senators on that of the entire legislative body. The defense counsel also argued that the lawsuit was overly broad and failed to identify specific instances in which the defendants damaged the coastline. “I’ve looked at every page of the exhibits. Nowhere is there any indication of what any defendant has done wrong,” Martin Stern, a partner at Adams and Reese, who represents Exxon Mobil Corp. said. In addition, Stern said SLPFA-E does not have a direct stake in the alleged damages as it is not a landowner with property directly affected by coastal erosion. In response on behalf of SLPFA-E, Gladstone Jones, of Jones, Swanson, Huddell & Garrison, said the defendants all were granted permits by the Corps of Engineers for oil exploration activities and that under those permits they dredged canals and drilled oil wells in violation of regulations and that direct evidence could be provided as the proceedings progress. Judge Brown said similar lawsuits have been dismissed in the past and that she was having an issue differentiating this lawsuit from those that have come before. “The issue I am struggling with is you have to make a complaint different than those that have been dismissed before,” she said to the attorneys appearing on behalf of SLPFA-E.
Another hearing for further arguments in the case is scheduled for Dec. 10.